Every September when I get that hint of a cool breeze, I know my favorite season is on the horizon. I can already smell the crackling fire, pumpkin spice, and warm apple pie. IT’S FALL YA’LL! 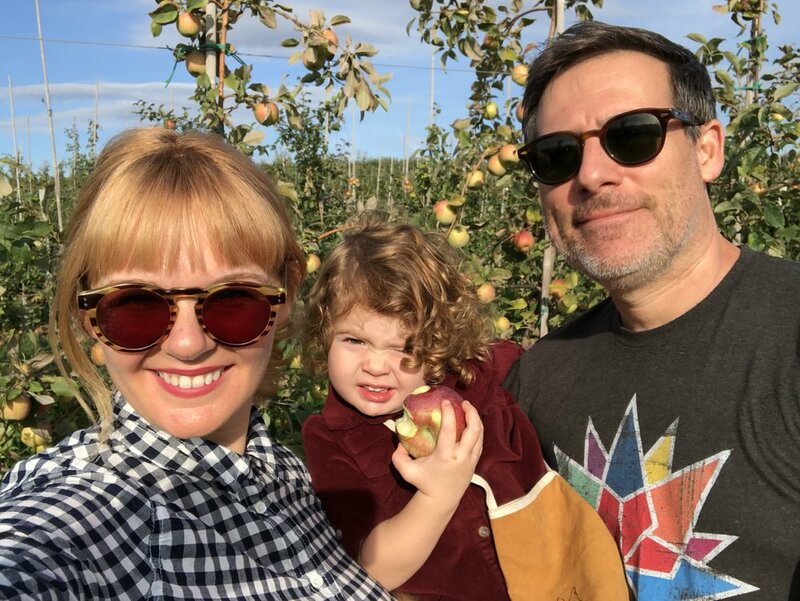 And what better way to bring in the season than with a classic fall activity that is ideal family fun (and a great setting for charming photo ops), yes, I’m talking about APPLE PICKING! There are countless farms upstate where you can pick your own apples and (I’ve been to many), but the one we keep going back to is Fishkill Farms. The photo ops, okay. It’s a no frills beautiful family owned farm. They have plenty of rows of apple trees so even if the parking lot looks crowded, you can still find plenty of space to take a series of adorable fall family photos (and pick apples). Sally was particularly into it this year and was quite pleased with herself for filling up her very own bag. Fishkill has the apple cider donuts everyone loves if you have the patience for the line. They also have an adorable farm store where you can get fresh seasonal fruit, coffee, fancy cheeses, and jarred things. Alan even bought a t-shirt there years ago that he still wears all the time! Got a favorite apple picking spot, let me know in the comments below! Below are way too many photos of us and apples!